You are currently browsing articles tagged James Renwick. Our title alone should interest all true Presbyterians. For anyone to be characterized by the principles of Scottish Reformer John Knox marks them as someone worth remembering. Such an individual was James Renwick. Born in the little Scottish village of Moniaive, in Dumfriesshire, of Christian parents with little worldly wealth, James was dedicated to the Lord as an infant for the ministry of Christ’s Church. It was said that when only two years old, in his cradle, he could be seen “aiming at prayer.” As the years went by, he did go through a brief period of questioning of spiritual things, but the Lord brought him through that period with full assurance of faith. Studying at the University of Edinburgh, he did well, but couldn’t graduate with his class because he refused to declare that the king was head of the church. At age 19, he witnessed a martyrdom in Edinburgh of Donald Cargill, a Covenanter. What he said on that execution block made a profound mark on the young man. James began to attend some of the United Society meetings being held throughout Scotland. Indeed, it was this latter group of faithful Covenanters who sent him to Holland to be trained for the ministry. There he was ordained for ministry at the age of twenty-one. Returning back to Scotland, he was ready to be used for the glory of Christ’s kingdom. 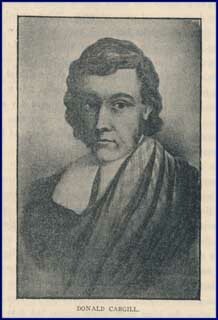 James Renwick’s first sermon was to a huge crowd of Covenanter Presbyterians who had gathered in a field in 1683. Such public gatherings were forbidden by the crown, with both parishioners and preachers subject to imprisonment and even death. But that did not stop the one who proclaimed the Word of God and offered the Sacrament of the Lord’s Super. Neither did it stop those who would walk many miles to attend the true preaching of the Word. It is estimated that Pastor Renwick baptized 600 covenant children in the first six months of his pastorate. His congregation was composed of 7000 Presbyterian members from the Central and Southwest part of Scotland. Riding on a strong horse, he went from field to field, from woods to woods, declaring the unsearchable riches of the gospel. Often, the British dragoons would narrowly miss arresting him. Truly, his time was not yet come, but one day in 1688, the Lord allowed the enemies of the gospel to capture him. Three distinct charges were laid against him. They were: 1. Refusing to acknowledge the king’s authority; 2. Refusing to pay the War Tax; and 3. Counseling his followers to come armed to the field meetings. Defending himself against the charges, it was around this time that it was said that he was of old John Knox’s principles. Judged guilty, he was condemned to die by hanging. It was on this day, February 17, 1688, that he was the last Covenanter to publicly die for the Covenanted Reformation of Scotland. He was twenty-six years of age. Words to Live By: We live in different times today, but that doesn’t mean that persecution will not and does not come upon believers for their faith. There is such a situation today called “the persecuted church.” With persistent prayer we should come before the Lord in remembering our brothers and sisters in other lands where simply professing Christ as Lord and Savior brings suffering and death. I suggest taking Psalm 79 to guide you in prayer for these dear saints, God’s own children. And in our own land, while freedom of religion is the stated principle of the First Amendment of our Constitution, increasingly we find Christians losing their livelihood due to their Christian convictions. Let us pray now, more than ever, for the freedom to proclaim the gospel. And if, when times of trial may come, may we fully rely upon God’s grace and strength to keep us faithful to the gospel once delivered unto the saints.